BMW is celebrating its 100th anniversary with a big bash in Munich, and apparently Mercedes-Benz feels left out. The solution? Some good old-fashioned trolling. They’re right, of course, with Mercedes-Benz tracings its roots all the way back to the Benz Patent-Motorwagen in 1886. BMW didn’t get started until 1916, when Bayerische Motoren Werke was officially founded in Munich. To make Bimmer-philes feel a bit more welcome in Stuttgart, the museum is offering a few perks in addition to the free admission. The first 50 BMW employees to tour the Mercedes exhibit get to taste a complimentary “Swabian specialty” from the museum restaurant, and any BMW driver gets a free parking space right out front. Mercedes-Benz is also running cheeky ads in German newspapers, which we found on Reddit. 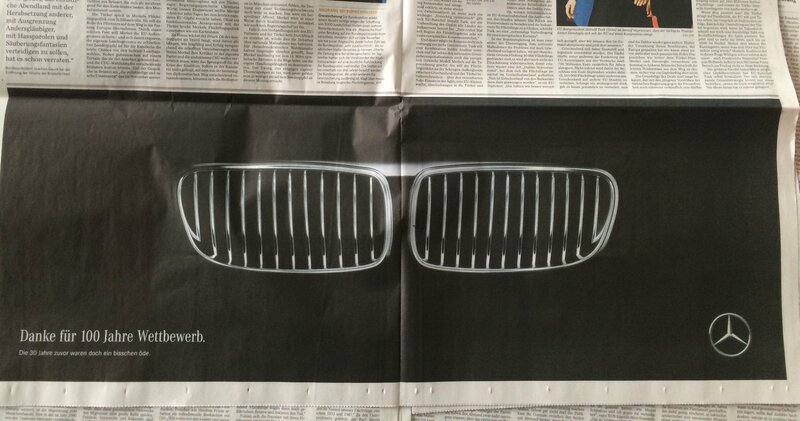 Under an image of the iconic BMW kidney grilles, the German text reads: “Thanks for 100 years of competition. The previous 30 years were somewhat dull.” We couldn’t agree more. There’s certainly no love lost between the German rivals, but at least they know how to have some fun.